UNCOMFORTABLE MOMENTS: One Night Stand: "Duffle Bag Boy"
The first time I heard this song was on a Chris Rock concert video. The next time was on a Katt Williams video. So those two comedians had already drilled it into my head and my iPod already by the time it served as exposition in The Carter. The documentary about Lil' Wayne uses the song to punctuate his substance abuse, flashing its opening callout about "weed n' syrup 'till I die" over footage of him. 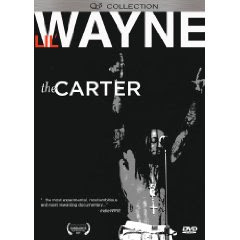 Perhaps this and similar moments are what prompted Lil' Wayne's decision to legally oppose theatrical release for the movie, even though he initially collaborated with the filmmakers. I suppose it's too late to get Lil' Wayne to correct the spelling of duffel bag in the song's title. Anyway, I'm sure the residents of the Belgian town for which the bag is apparently named are used to the alternate spelling by now. It's just something that bugs me a little. But hey, now I know we got the duffel bag from Belgium. I haven't been able to get the song out of my head since watching The Carter the other night. I am sad that Lil' Wayne is going to prison and inseminating women left and right, thus risking his career and finances. To me, this and other performances, along with his ambition to release a rock-rap album, make him someone that the rap game needs right now. And yes, I am a white nerd who has no business typing the phrase "rap game." But you know what I'm saying.